Firstly, your hair is so dab. Love the look, very casual, very well put together, very chic. Have a fantastic week my friend. I love how casual and chic this is! By the way, that vest is an amazing color for you! Thank you so Mary. You’re very kind. As for the color, it’s so bright but I love it. What a beautiful necklace! I can’t believe it is Zara. I love the boots, as always! You looks amazing in this outfit! Have a wonderful week, beauty! Hi Miri. Thank you so much. I love those boots! I think they look lovely 🙂 Great outfit! Those boots are the ones to have this season and they look great on you. Thanks Rachel. They’ll look much better once they’re finished being altered. I love how you styled your plaid shirt with the vest and the OTK boots. You look fabulous! I have the same boots and absolutely love them. Have a wonderful day! Sure you’re bias but how could you not love these boots. Loving your layers… that plaid top is right up my style alley! Who doesn’t love plaid? Thanks Amber. 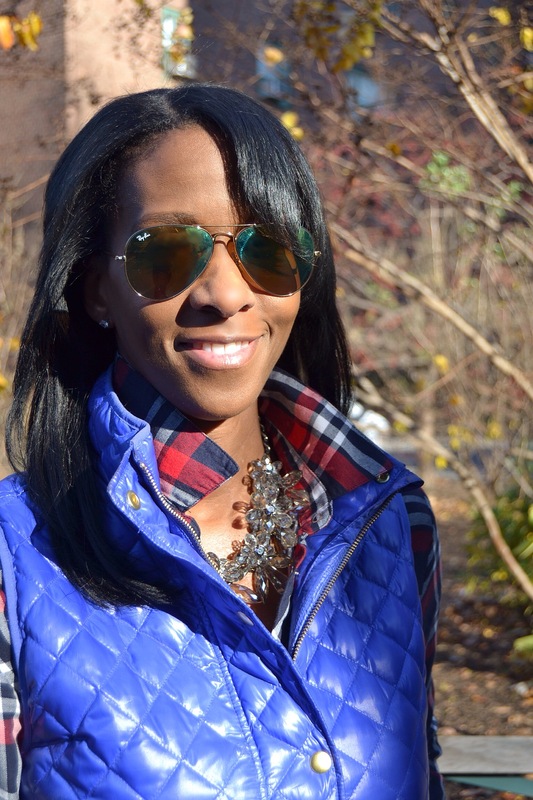 Love your plaid shirt against the bright blue vest! Thanks. It’s bright but fun. I love the contrast between the deep blue vest and the plaid shirt. So eye-catching! And the boots are amazing! What a gorgeous casual-chic outfit! Those OTK boots are absolutely amazing! Digging the weekend vibe here, lady! And those boots are fab! I love the super glam statement necklace paired with the more casual vest, so chic! Thanks Jesica. The basic little flannel needed an extra kick. First off, those boots are incredible! I am so jealous, they’re gorgeous. Second, I’m loving how you styled this look. So chic! Thank you Katie. I thought the look was more wknd casual than chic but I’ll take it for sure. You’re too kind. This blue is stunning! Loving your casual weekend vibe. Have a great week! Love this casual but polished look! The color of your vest is BEAUTIFUL! Thank you so much. The color is really bright but I love it. My favorite fall piece of the season. 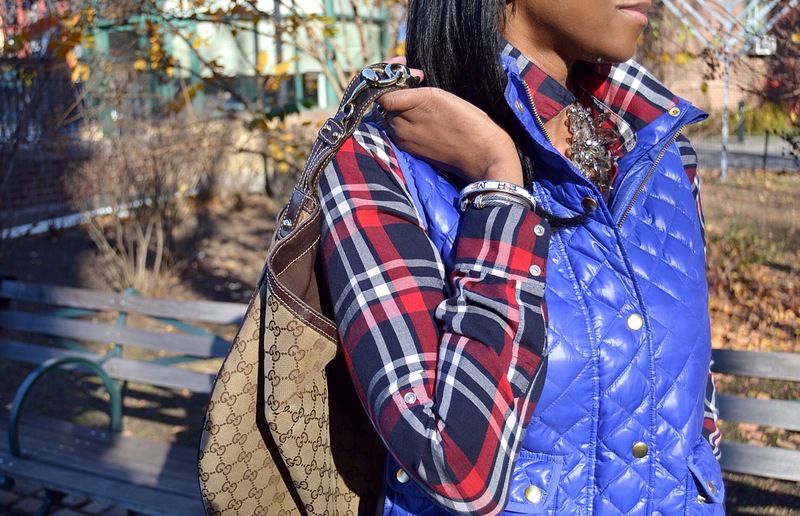 Loving the pop of blue, especially over plaid! Love your style!! Very casual look! Amazing! 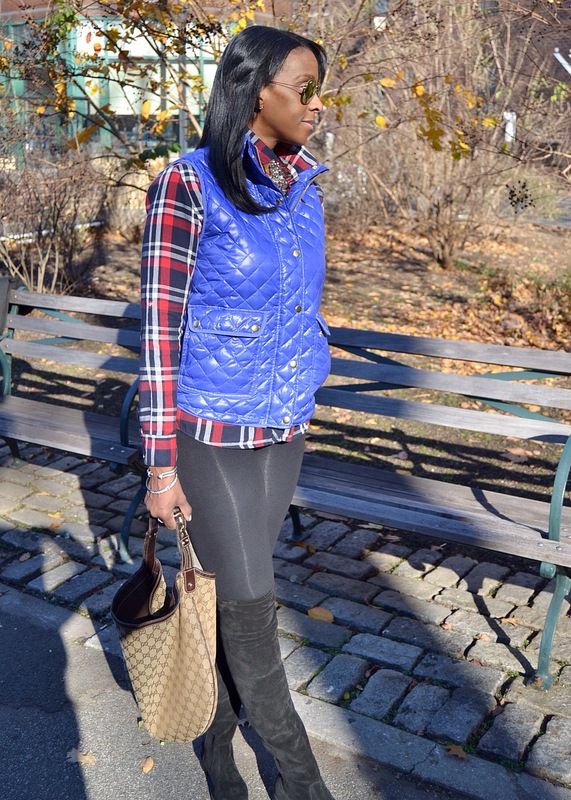 I love quilted things and this vest is such a bright fun colour! Thanks Karen. Yes, the color is out of control bright but that’s why I love it. A colorful fall/winter piece. Hi Vicky. I just reviewed your blog. Very cute. You have such a fun energy and that comes across on your blog. Working together sounds fun. This is an awesome casual outfit! I love how you created a casual outfit with those infamous boots but still look chic! Thank Rach. I see these boots as casual or dress. It just depends on my styling that day and what the other pieces warrant. Thank you so much. Not a problem. Loving how you dressed up a button down with that stunning necklace!! Too pretty!! 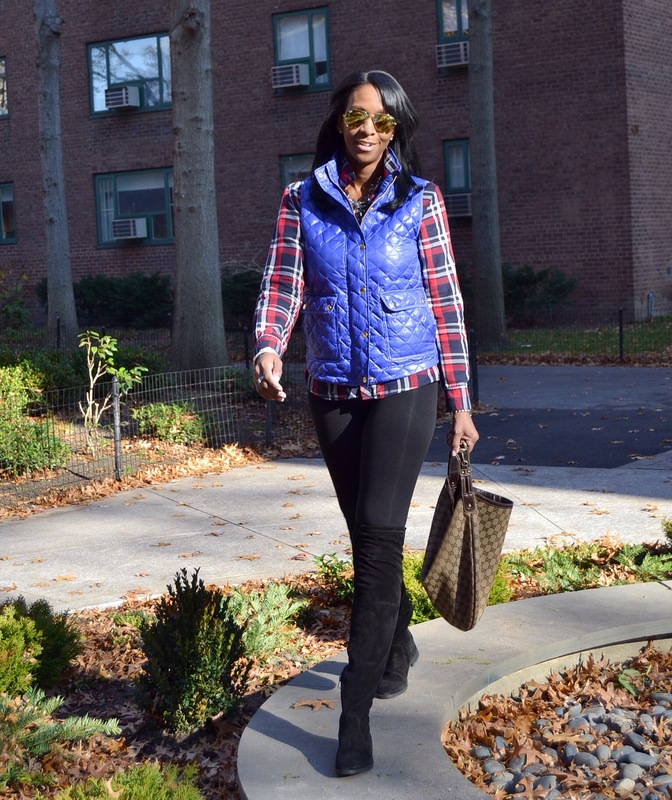 Great simple and chic outfit overall and it’s nice to see a bright vest in dreary winter! Have a wonderful day! Hi Lauren. I’m not ready to give up on color just yet. I wear dark color to work all the time. Come the wknd, I want to wear pieces in fun shades. This vest does just that. 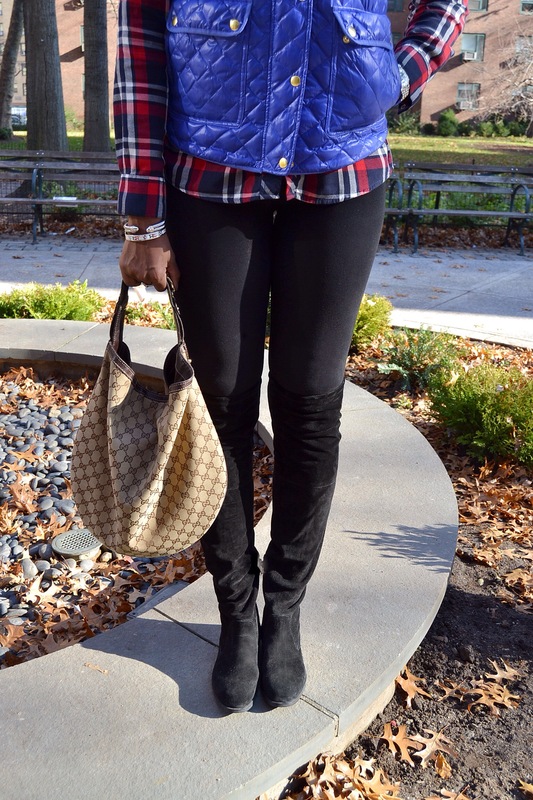 I absolutely adore the way the cobalt vest looks paired with the flannel shirt! I’m also loving those boots and that fab Gucci purse! Great styling, as always, beautiful, and thanks so much for the inspiration! Hi Jalisa, I haven’t been to your blog in a few days. That ends today! As for my look, thank you so much. Really? They’re Ray-Bans. I thought everyone owned a pair. You really have to run out and try a pair on and then purchase them. They’re classics and look good on everyone. I love that bright blue vest on you! Such a flattering color! You’re so right. Thanks for stopping by. 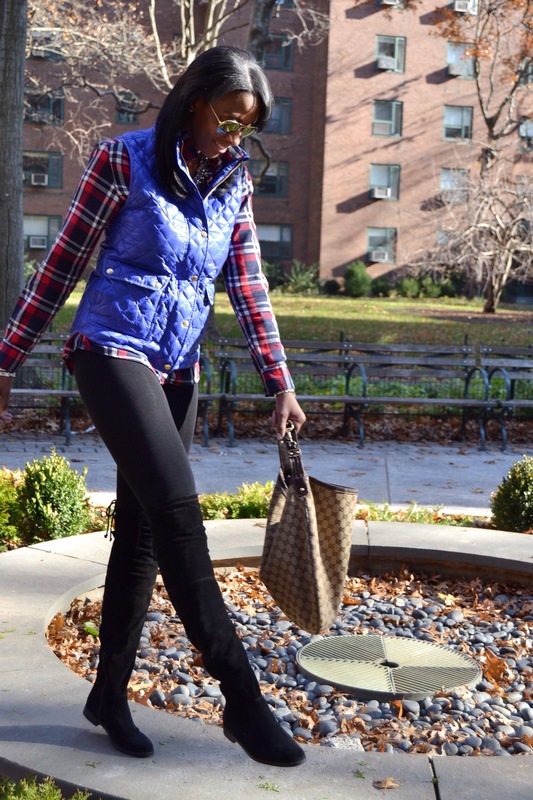 Love the color of your vest and this casual chic look! These boots and a Chloe bag are my ultimate wish! I didn’t realize they came in a narrow. That’s nice. They look lovely on you. I didn’t realize that either, at least not right away. You can only the the narrow, standard, wide from the SW boutique. The regular retailers only have one size. You look so cool with your Ray-Ban!! LOVE that jacket! What a fab colour – suits you! Thank you so much Gabrielle. What a wonderful critique of my ensemble. Thanks Jessica.Well then I’m in good company. Such a wonderful combination of colors! Also, I love those boots, I’ve been looking for a pair like that. Thanks Hanna. The Stuart Weitzman are the best out there. You can find plenty for a much less price point but the quality & craftsmanship isn’t the same. Come of my friends think I’m crazy for spending almost a $900 on boots but I say…..price per wear, I’m ahead of the game. This is such a great look. I especially love the accessories you paired with it – the sunglasses in particular are SO CUTE! You look great! Love the vest, the color is amazing. Thank you so much. JCrew works with the best colors. You can NEVER go wrong with cobalt in my book! Alissa, I couldn’t agree with you more. those boots! I like the otk/no heel combo. And good on your for getting them fitted… I always say I will but it’s yet to happen! Yea, they’re still really baggy here in these pics but soon I’ll have pics from a photo shoot that I did after getting them altered. As for them being the low heel, totally. I’m already blessed with height so I don’t really need the heeled ones. Plus I’m the fence as to if the ones with the high heel look, (lets just say) less than lady-like if you know what I mean. I suppose it’s how the look is styled and/or how one carries themselves. I love that vest Shoshana! Perfect paired with the plaid shirt!